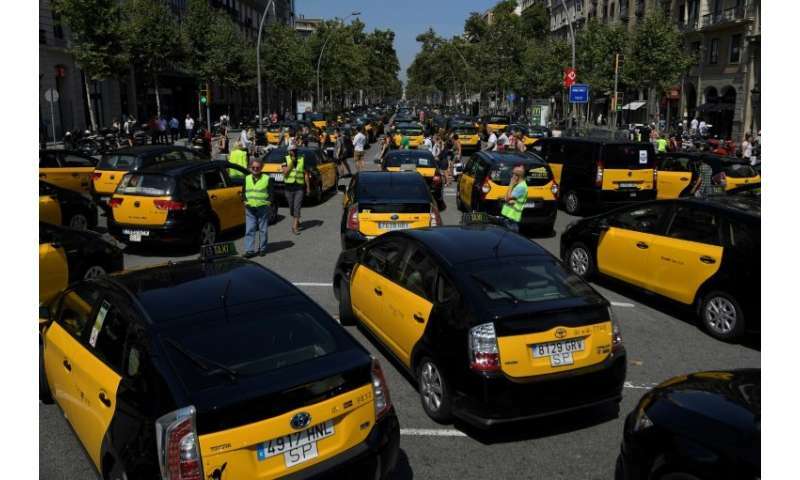 Taxi drivers in Madrid went on strike Saturday in solidarity with Barcelona cabbies protesting against "unfair competition" from Uber and Cabify. "All taxis have spontaneously and progressively stopped work, paralysing services in the capital, at the airport, around bus and railway stations", federation secretary Santiago Simon Vicente told AFP. "The main problem is the proliferation of VTC licences," he said. "There are more and more of them, thousands, and it's unfair competition." Today there are only five for every VTC, said Santiago Simon Vicente. "Today everything is blocked in Barcelona, the airport, the stations, etc," the head of Taxis Companys, Luis Lopez, told AFP. Unauto, which represents Uber and Cabify, on Saturday urged the Spanish government to "take back control of the streets saying "violent" taxi drivers were trying to defend a monopoly. Meanwhile hundreds of thousands of former customers showed their solidarity with Uber and Cabify by using them instead because the "traditional" taxis were otherwise engaged. Brilliant move, cab drivers. Way to win over your customers. Oh, wait, you never gave a sh!t about customers in the first place. You were trying to secure control of the market by fascist means to compel people to pay whatever you dictate, rather than deal with the thorny mess of the free market where customers and competition also have an influence on prices. The heart of Francisco Franco beats strongly in the cab drivers of Madrid. Francisco Franco, the dictator credited with the "Spanish miracle," almost two straight decades of economic boom spurred by a move to free markets as a new wave of technocrats were put in control of the economy? Franco, the anti-communist general? Your knowledge of history is a little weak.